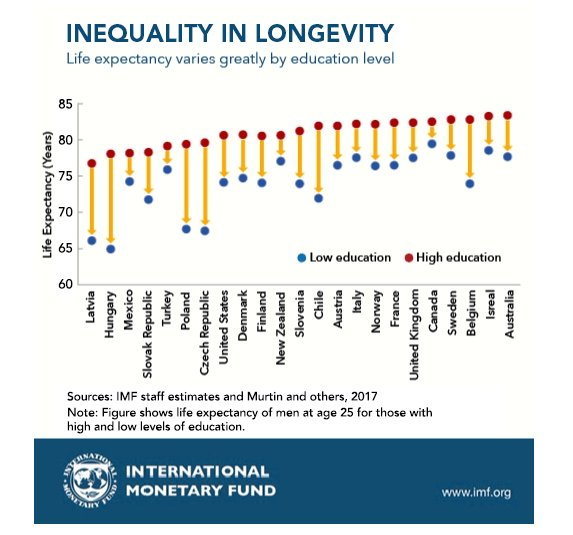 The Fund’s Chart of the Week shows "how this longevity gap, which reflects inequality in access to health care and its impact on peoples’ overall health, varies across countries." Men with a lower level of education live shorter lives on average than their better educated counterparts domestically. The gap ranges from four years in Italy, to 14 years in Hungary, the IMF said. The Fund's review included a wide cross section of rich and middle-income nations. "These health gaps represent a huge loss for people and the countries where they live," the IMF said. "Poor health leads to disruptions in employment, which results in lower lifetime earnings. Also, a labor force with poor health hurts a country’s productivity and economic growth."